The 2018 Acura TLX is the latest mid-size sport sedan from the maker of the Acura NSX, and the performance influence of the NSX is evident on every TLX in Morris County. Both exterior design and raw performance capabilities on the TLX take cues from the supercar, and whether you choose four-cylinder or V6, FWD or SH-AWD, the TLX brings the thrills of the track to the everyday drive – down the Jersey Turnpike or the country toad. The standard engine is anything but, delivering 206 hp at 6,800 RPM and 182 lb-ft of torque at 4,500 RPM, paired to an 8-speed dual-clutch transmission and equipped with Precision All-Wheel Steer. 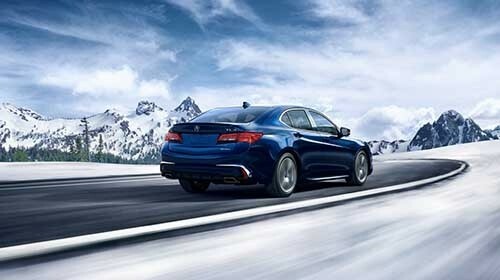 Drivers seeking more power – and the option of SH-AWD – should look to the TLX 3.5, with 290 hp at 6,200 RPM and 267 lb-ft of torque at 4,500 RPM, with 9-speed automatic transmission and standard Precision All-Wheel Steer. The first such system on a production vehicle, P-AWS redefined front-wheel drive; it independently adjusts rear toe angles for improved stability and increased agility while cornering, braking, or changing lanes. Available on TLX 3.5 models, Super Handling All-Wheel Drive lives up to its name, adjusting power from front to rear and side-to-side as needed – conquering curves and weather with ease and grace. We’ve touched on just the highlights of the 2018 Acura TLX performance features and specs, but we can only say so much in words – like how it trumps the Audi A4’s 252-hp turbo. We think our Essex and Somerset drivers should make the visit to Morris County and experience the TLX for themselves at Autosport Acura of Denville. Contact us today and let us know if you have a preference – or we can just schedule you some time behind the wheel of the four-cylinder and the V6.